Assertive acidity and massive body supported by flavors of juicy summer berries, dried apricot, pomegranate, grapefruit and blood orange enrobed in vanilla custard. Deeply saturated and winey. Las Margaritas is one of four farms owned and operated by Luis and Rigoberto Herrera in Caicedonia, Colombia. Their farm is perched high upon the Cordillera Central in a captivating setting shaped like a natural amphitheater. We have worked with the Herrera Brothers for over seven years and have shared some outstanding highlights during this time. Their 94 point scoring La Esperanza (Coffee Review, March 2012) and their first year harvest of the Las Margaritas Gesha in 2014 are two that we recall fondly. The Margaritas Noir is altogether different, yet equally stellar and certainly a new experience for all of us. And leave it to the Herrera Brothers to invent a new method for preparing coffee! With the Margaritas Noir they have subjected a segregated Bourbon variety to an initial in-mucilage fermentation which is akin to the first stages of the natural process. The coffee is then washed for seventy-eight hours followed by silo conditioning for an additional forty-eight hours. After that, the coffee is patio dried for two days and then is returned to the silo where undergoes its final drying stage. This is a first. 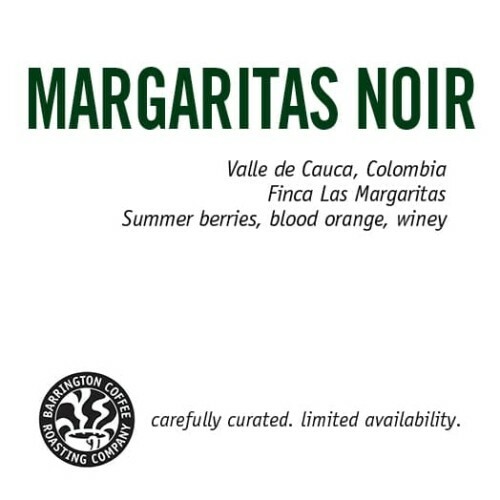 The Margaritas Noir has been produced without the use of pesticides, herbicides or synthetic fertilizers. After repose, we seal this coffee in Grain-Pro barrier packaging in Colombia and then send it on its way to our Roastery where we preserve the green coffee under hermetic seal until it is roasted as part of our Barrington Green Seal Program© . The Margaritas Noir is in very limited supply and is only available as a part of our 2019 Winter Curated Collection. This Collection includes smaller, 4 ounce bags of three particularly exotic coffees; Margaritas Noir from Valle de Cauca, Colombia, Feku Double from Oromia, Ethiopia and Korgua Peaberry from Tambul, Papua New Guinea. We have designed this collection to inspire every coffee lover along their culinary journey. 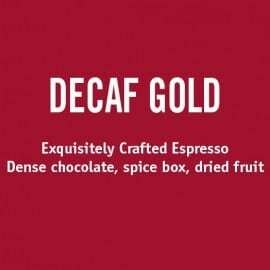 This coffee will be roasted and sent only on Wednesday of each week.